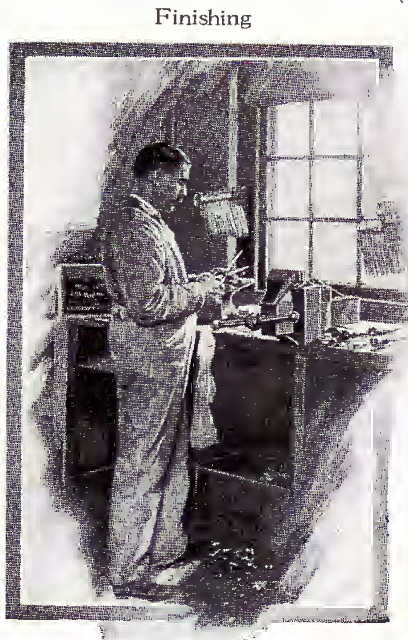 The images presented here are from a 1907 Wiss catalogue and compared with a middle 1930s catalogue but the techniques mentioned are very similar to how most early 20th century American shears were made. Note that this technology does not apply to makers from other countries who used different methods and technology, many of which were either not documented or were trade secrets. 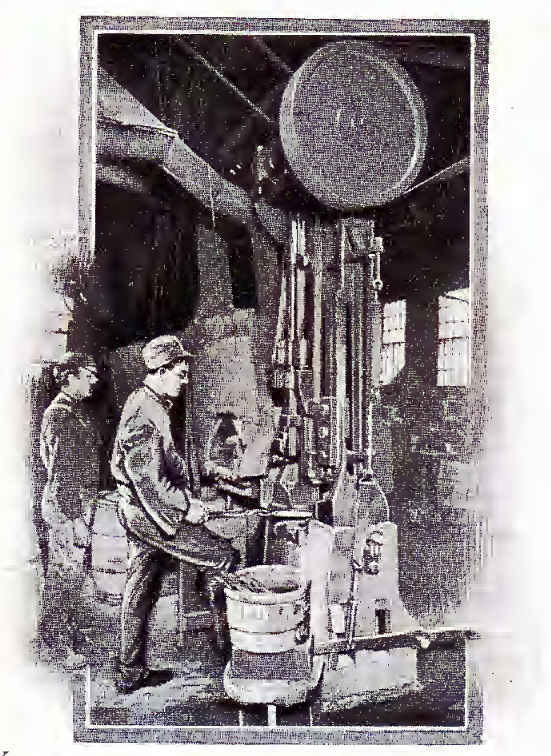 These large drop forges were used to forge the blank steel/iron into the basic frames for the upper and lower blades of shears and scissors. 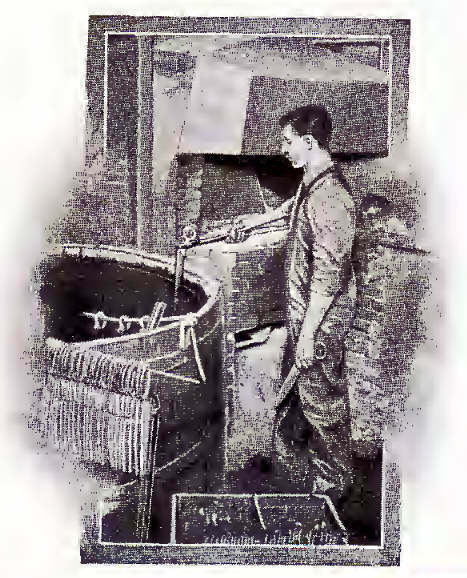 The technique is for the operator of the forge to grab a white hot bar of steel/iron, place it in the dies in the forge and repeatedly hammer the billet until it has the correct shape. A drop forge of this size operated at many tons impact. 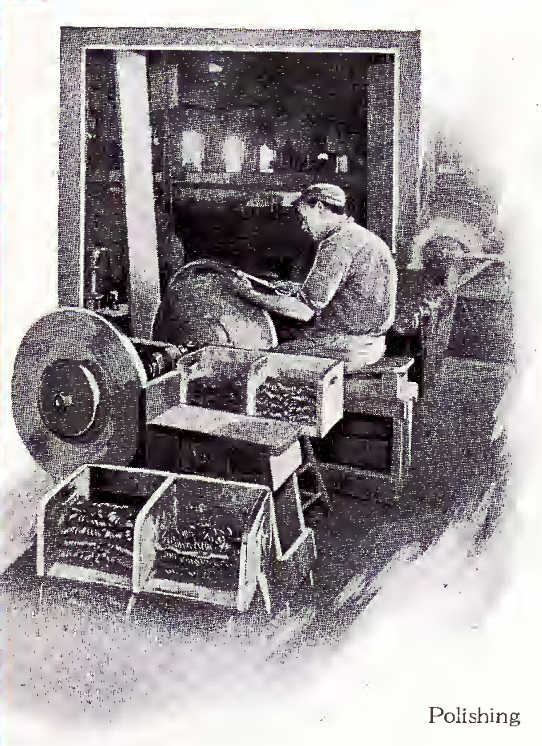 Using this technique of high temperature and high tonnage in a drop forge effectively welds the inlay onto the steel/iron frame. The inlay is located by a pin on the frame then while white hot it is forged until the the inlay is permanantly fused to the frame. This process is done by re-heating the blade until it is white hot and quenching it in running water which hardens the inlay then it is very carefully re-heated until it reaches a certain temperature to partially soften the inlay so it is slightly ductile yet has a hard enough and tough edge. This is called "tempering" and it is a critical process for shears and scissors as it dictates how well the cutting edges wear into each other under use. This is a process where a highly skilled operator straightens the blades after the normal distortion that occurs in the previous heat treatment operation. The important thing to note here is that this operation is done BEFORE the blades are machined to a high precision shape. A common mistake made long ago was taking shears that had become blunt with use to a blacksmith who instead of sharpening the blades, bashed them along the inside face with a hammer to change the curvature of the blades. 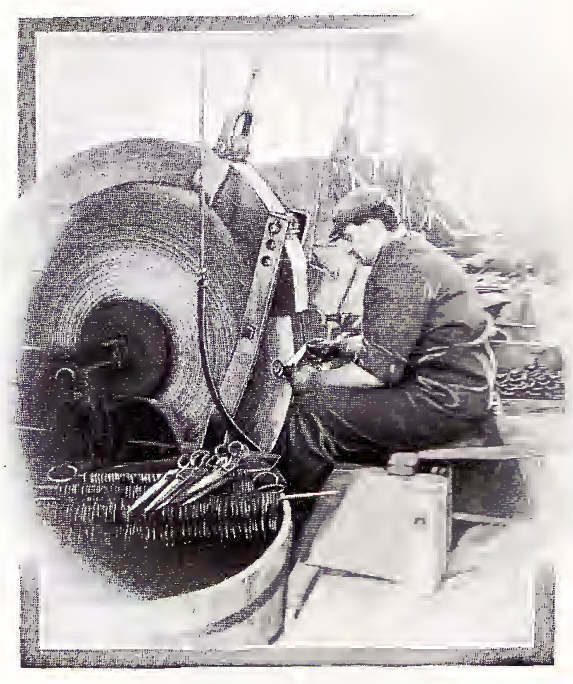 Many good pairs of shears have been detroyed by this technique which sometimes causes fractures in the inlay and even if they are not cracked the precision curvature set in the factory is destroyed and the shears may cut but not in the smooth and precise manner that the original shears had. The is the start of many precision processes that shape and match the two blades. The two blades must be drilled and machines to accept the hinge (normally referred to as the shear bolt), hollow ground by hand as the image shows, the outside of the blades and the handles have to be finished before they are assembled and tested. 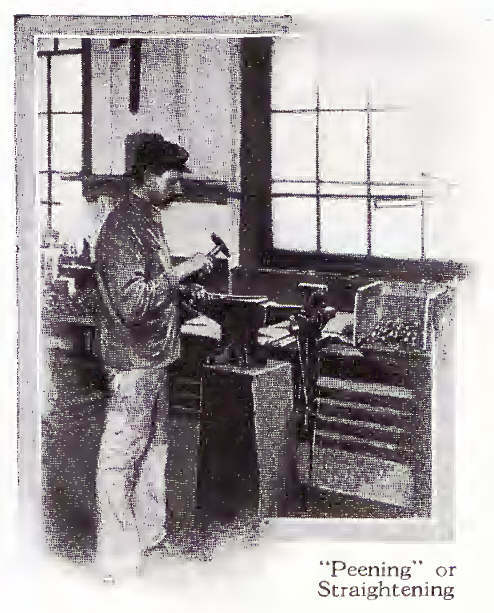 Although these are now archaic techniques to finish metalwork, for the available technology they produced very good quality work. 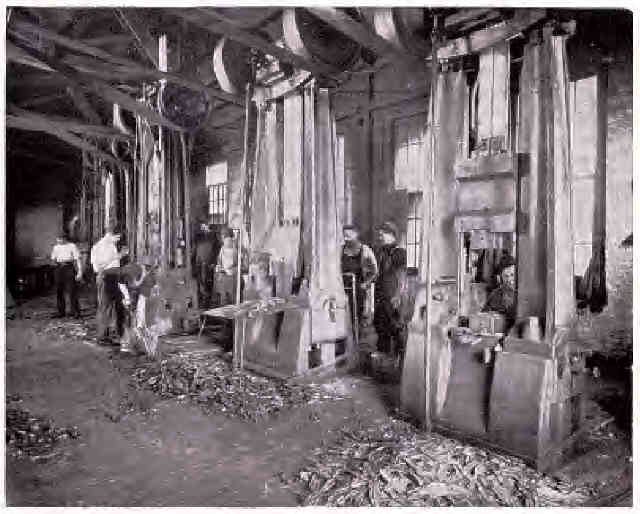 Instead of modern industrial supplies, many of these abrasives has to be made manually by the company but the result was a bright smooth finish that gave the items a professional appearance and did not leave sharp edges that would snag on the fabrics being cut. This is the last operation which acts like final quality control. The assembled pair are checked for defects, if any are found they are discarded. Final minor adjustments are made and the shears are tested to make sute they perform correctly. Then they are packaged and sent off to the distribution network.